© Delil Souleiman/AFP/Getty Images A member of the Syrian Democratic Forces watches as a U.S.-led coalition Chinook helicopter flies by in Shaddadi, Syria, on Tuesday. U.S.-backed forces have launched what they hope will be the final battle for territory in the four-year old war against the Islamic State with an assault on the militants’ last major holdout in the eastern Syrian desert, the U.S. military said Tuesday. The battle, however, won’t however spell an end to the threat posed by the militants, who are already regrouping in pockets of territory in Iraq and also maintain cells scattered across the vast desert area to the west of the Euphrates, which is under Syrian government control. But they include the toughest and most ideologically committed militants of the entire war, with experience gained in battles such as Mosul and Raqqa. They are unlikely to give up easily, said Col. Sean Ryan, a U.S. military spokesman in Baghdad. The militants have laced the area with underground tunnels, riddled it with explosive devices and are expected to launch multiple suicide attacks against their attackers rather than submit. “We’re thinking it’s going to be a very difficult battle, and it’s not going to be a quick one,” Ryan said. He would not put a timeline on the fight but said it is not expected to continue past the end of the year. “They’re going to fight to the end and it’s going to be tough,” he said. Kino Gabriel, a spokesman for the SDF forces, which will bear the brunt of the ground fighting, said many foreign fighters are among those making a last stand in the Hajin pocket. It has also been widely speculated that the town, or one of the surrounding villages, could be the hiding place of top Islamic State officials, including perhaps their leader, Abu Bakr al-Baghdadi. Secretary of Defense Jim Mattis said Tuesday that he “wouldn’t be surprised” if some ISIS leaders were in the Hajin area. But, Gabriel said, it is more likely that Baghdadi has already escaped the U.S.-led coalition’s dragnet and is taking refuge in one of the other pockets of terrain loosely controlled by the Islamic State. “There is a possibility that Baghdadi is in that area, but there are a lot of areas in both Syria and Iraq that he could be hidden in. I don’t think he would allow himself to be surrounded from all sides,” he said. The offensive in eastern Syria comes at a time when international attention has been focused elsewhere in the country — on Idlib province in the northwest, where Syrian government forces are massing for a possible assault on a rebel stronghold. The offensive for Hajin, code name Operation Roundup, has been months in the making. 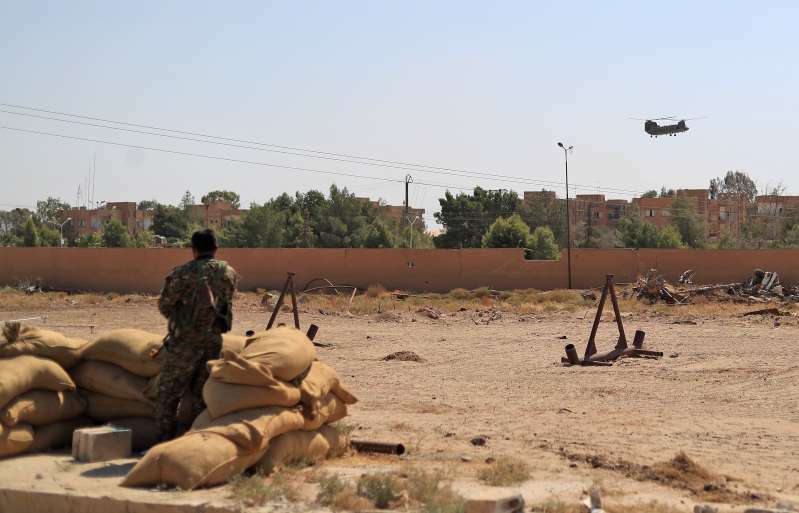 It comes after Trump administration officials put an end to the uncertainty surrounding the fate of the northeastern Syrian enclave controlled by the SDF by declaring that U.S. troops would stay there indefinitely. The United States maintains about 2,000 troops in northeastern Syrian, across an area amounting to more than a quarter of the country. They were dispatched there to aid in the fight against the Islamic State and in the process facilitated the expansion of the Kurdish-dominated SDF into vast areas of mostly Arab-populated territory. The withdrawal of the troops would have left the area vulnerable to the ambitions of the Syrian government to reclaim all of the territory it lost after the uprising against President Bashar al Assad in 2011. But earlier this month, Trump administration officials said they had switched course, and that U.S. troops will remain indefinitely in the area, pending an overall solution to the Syrian war, both to ensure that the Islamic State doesn’t return and that Iran doesn’t expand its influence there.